Strawberry ice cream recipe - Today I have a wonderful strawberry ice cream recipe for you all. Starwberry is a seasonal fruit that is available only for few months of the year. Mahabaleshwar strawberries are luscious, fleshy and has less tanginess. It is a very popular fruit in Maharashtra. 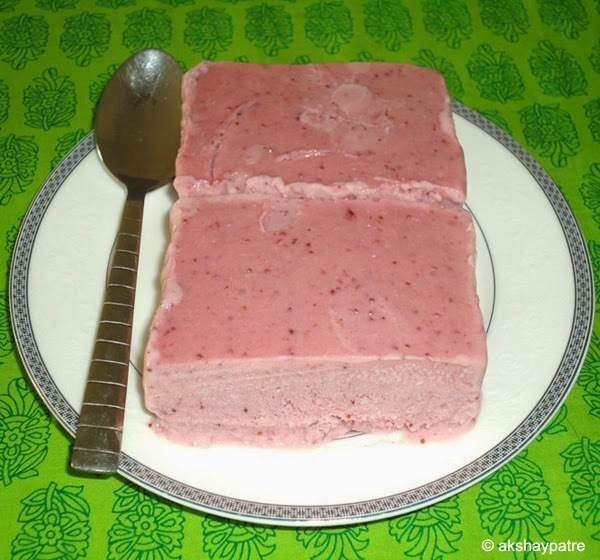 Variety of dishes can be made with strawberries. 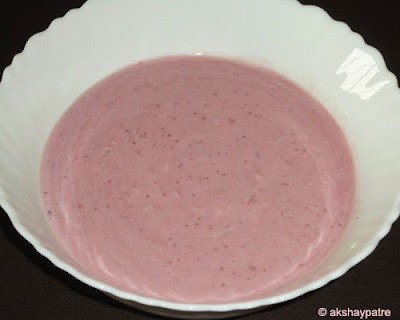 I prepare strawberry ice cream, milk shake, jam, lassi, shrikhand and raita regularly during the season. 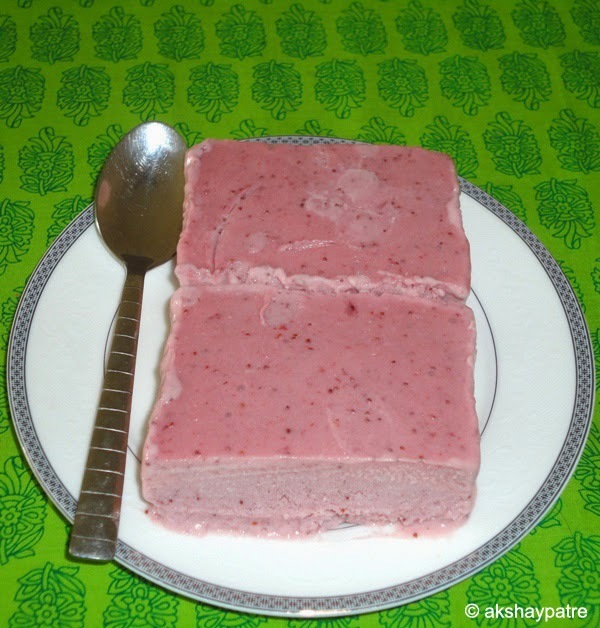 Strawberry ice cream may be one of the most easiest and simplest dessert to try. The whole process is very simple when you have few strawberries in hand. This is a melt in mouth dessert that can be enjoyed by both kids and adults. I am sure, you will definitely love the taste and texture of the ice cream. Put the sliced strawberries in a pan and cook covered on low flame. Don't add water. When the strawberries become very soft and mushy, remove the pan from the heat. Allow it to cool. Put them in a mixer jar and blend it to a smooth puree and set aside. Don't add water. Take milk powder and corn flour in a bowl. Add 2 tbsp of milk and cinnamon powder. Mix and make a thick paste. Pour 2 cups of milk in a pan, add sugar, and mix. Place this pan on a medium heat. Bring the milk sugar mixture into boil. 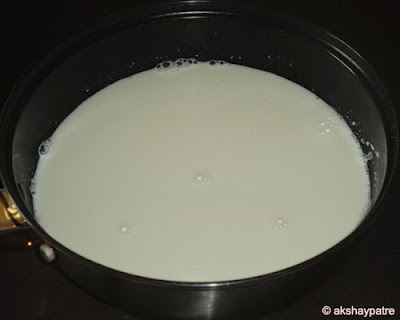 When the milk starts boiling, add the milk powder and corn flour mixture, again bring it to boil stirring continuously. Further, simmer for 2 minutes and remove the pan from heat, allow it to cool. Now take cooled milk mixture, strawberry puree and fresh cream in a large bowl and combine well. Pour this mixture in an aluminium container. Place the container in the deep freeze for about 2 hours and allow it to set. After 2 hours, transfer the mixture to a mixer jar and blend it. Transfer the blended mixture to the same container. Place the container in deep freeze for 6 - 8 hours and allow it to set. When done, remove the container from the fridge, keep it aside for 5 minutes. Serve the strawberry ice cream. 1. 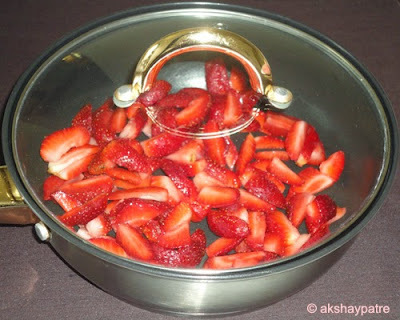 Put the sliced strawberries in a pan and cook covered on low flame. Don't add water. 2. 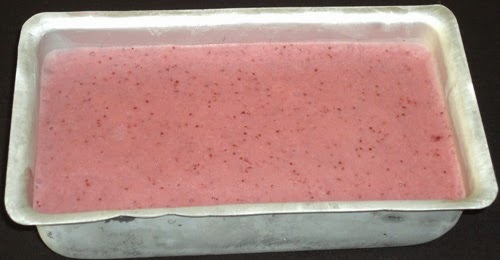 When the strawberries become very soft and mushy, remove the pan from the heat. Allow it to cool. 3. Put them in a mixer jar and blend it to a smooth puree and set aside. Don't add water. 4. Take milk powder and corn flour in a bowl. Add 2 tbsp of milk and cinnamon powder. Mix and make a thick paste. 5. Pour 2 cups of milk in a pan, add sugar, and mix. Place this pan on a medium heat. 6. Bring the milk sugar mixture into boil. When the milk starts boiling, add the milk powder and corn flour mixture, again bring it to boil stirring continuously. Further, simmer for 2 minutes and remove the pan from heat, allow it to cool. 7. Now take cooled milk mixture, strawberry puree and fresh cream in a large bowl and combine well. 8. Pour this mixture in an aluminium container. Place the container in the deep freeze for about 2 hours and allow it to set. 9. After 2 hours, transfer the mixture to a mixer jar and blend it. 10. Transfer the blended mixture to the same container. Place the container in deep freeze for 6 - 8 hours and allow it to set. When done, remove the container from the fridge, keep it aside for 5 minutes. 11. 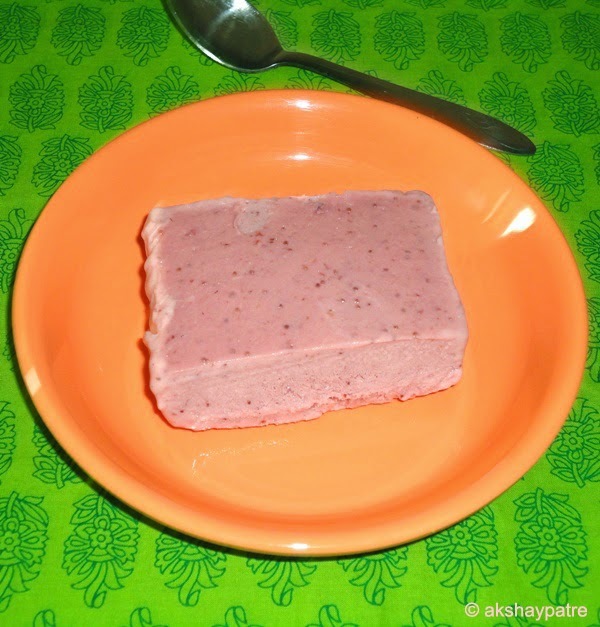 Serve the strawberry ice cream. I LOVE strawberry ice cream! But I have not made any homemade...yet. This looks so good! strawberry ice cream looks delicious.